Research has shown that these effects include improved healing time, pain reduction, increased circulation, and decreased swelling. The goal of laser therapy is to deliver light energy units from red and infrared laser radiation, called photons, to damaged cells. It is the consensus of experts that photons absorbed by the cells through laser therapy stimulate the mitochondria to accelerate production of ATP (purest form of energy created by the body). This biochemical increase in cell energy is used to transform live cells from a state of illness to a stable, healthy state. Conditions that Cold Laser Therapy is known to help include: headaches & migraines, herniated disc, arthritis, peripheral neuropathy, sprains/strains, plantar fasciitis, fractures, and tendinitis. Photobiomodulation or more commonly known as low level or cold laser therapy has been used in a wide variety of ways with good results over the past 10 years for conditions such as. You will commonly see this tool in use at progressive offices with Doctor of Chiropractic, Physical Therapists and even Sports Medicine and Orthopedic clinics. With the success of cold laser and the concerns of NSAIDS and opioid pain killers, Cold laser is a progressive non-drug option for many patients that is very affordable. Its results using a very specific wavelength of light therapy can help speed tissue repair, calm exacerbated nerves and reduce pain and inflammation. 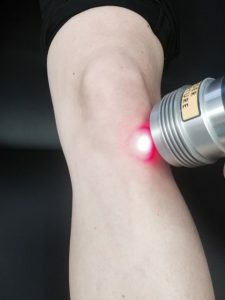 Cold laser can also be used to target acupuncture trigger points and tissue with red light photons to reduce pain and help with the healing process. 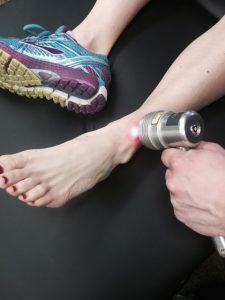 If you are curious if cold laser therapy can be helpful for your neuropathy, athletic injury or body pain please give us a call or visit our Lee’s Summit, MO office to set up a complimentary consultation. The human body is made to heal itself, but when the body gets stuck in a destructive loop and is unable to reverse the damage, cold laser therapy helps the body heal, and stimulates the body to release endorphins, which is the body’s natural pain killer. Cold Laser Therapy stimulates lymphatic draining and increases the body’s natural blood circulation. An increase in fluid circulation allows the harmful toxicants to be released from the body and helps relax the body’s muscles, which if untreated can cause body fatigue. How many treatments a patient needs depends on the nature and severity of the condition as determined by one of our elite doctors here at ASFCA. Treatment plans are tailored specifically to each patients’ needs. One treatment is simply not enough for this therapy because Cold Laser Therapy works on a cellular level. It takes time for your cells to communicate with each other and it is because of this that the average recommendation for treatments range from at least two to four treatments a week initially.